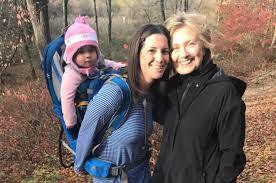 When I first heard about a hiker having a chance encounter with Hillary the day after her concession, it struck me as suspicious. How could a presidential candidate and a former president, likely with half a dozen Secret Service agents in tow, wander down a public trail without people noticing? To me, it smelled like a staged photo op. Turns out that was probably the case. It's now known that the woman who posted the "chance encounter" photo has met Hillary in the past. And now she's removed the photo from her Facebook page.